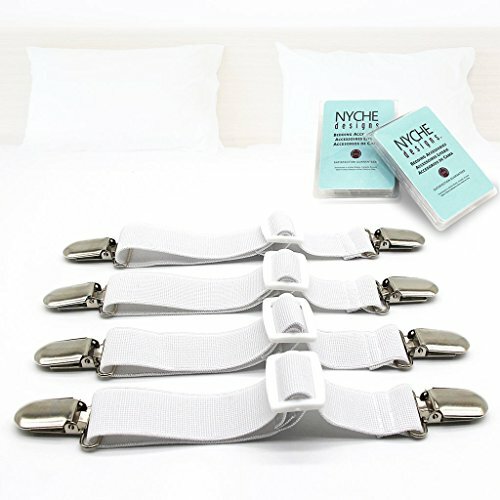 The Nyche Designs Adjustable Heavy Duty Bed Sheet Grippers Holders Cover Suspenders (Set of 4) by The Nyche Designs at Fine Kitchen Supplies. MPN: The Nych. Hurry! Limited time offer. Offer valid only while supplies last. Nyche Designs focuses on bedding accessories that make your life easier. Use sheet fasteners and never worry about messy or wrinkled sheets again. View More In Bedding Accessories. If you have any questions about this product by The Nyche Designs, contact us by completing and submitting the form below. If you are looking for a specif part number, please include it with your message.